'Hyperkulturemia' is a psychosomatic disorder that causes rapid heartbeat, dizziness, fainting, confusion and even hallucinations when an individual is exposed to an experience of great personal significance, particularly viewing art. 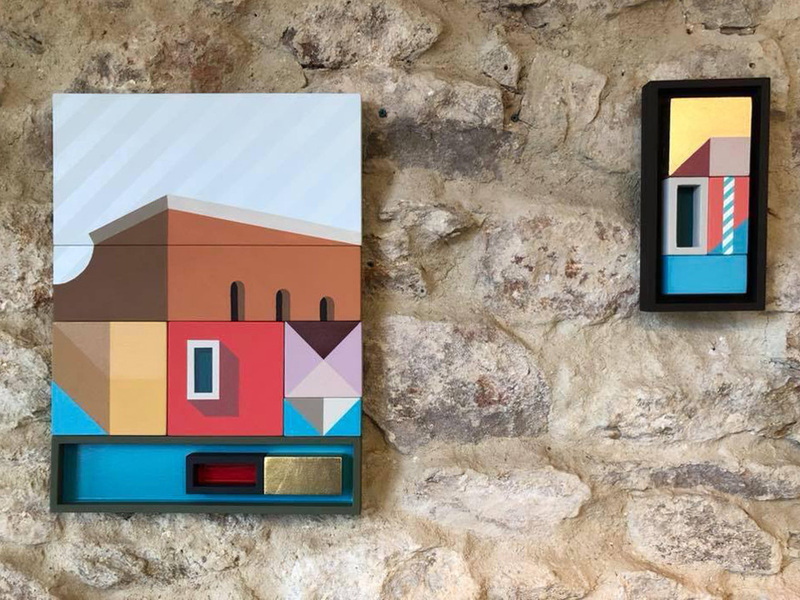 ‘Hyperkulturemia’ is also the title of the sold out exhibition of sculptural paintings by Matthew Sheargold exploring memory and experience through colour, lighting, and geometric studies. Sheargold is an award winning designer who draws on over 20 years experience working as an interior, furniture and product designer to inform his artwork. Fighting a constant battle to loosen up, his work is structured and restrained, using shapes, forms and symbols as efficiently as possible to tell a story. Drawing from fond memories and random moments, Matt's work seeks to explore the essence of the journeys we take and just how much detail our mind needs to remember them. The exhibition was sponsored by Axolotl Paint with all the artworks using paints from the Chroma and Metta ranges. Sheargold says, “Metta has a beautiful matt texture which worked brilliantly as the base for my works. Combined with different sheen levels of the Chroma range, Axolotl Paints were the ideal medium”. Whilst your next design project may be a simpler expression than Matthew’s paintings, the superior pigmentation and depth of colour of Axolotl Paint will elevate it to be a work of art in itself. You can find more images of the ‘Hyperkulturemia' exhibition here. 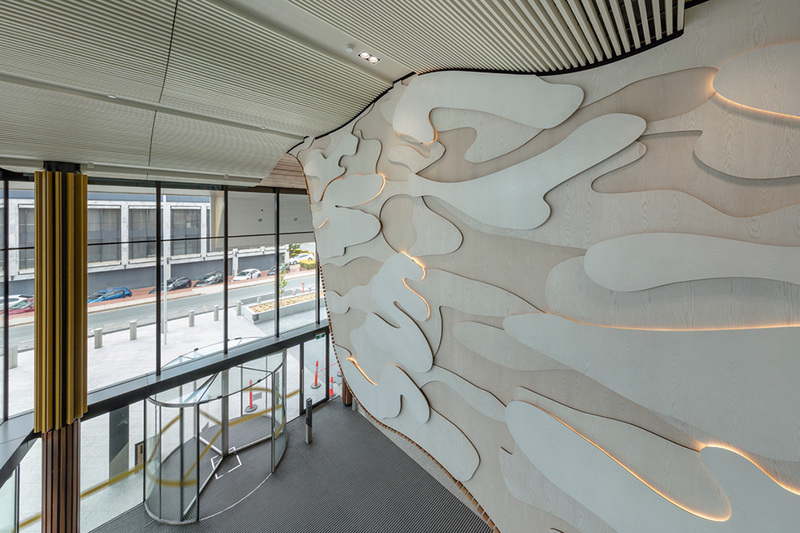 The Scribbly Gum artwork floats along the side of a suspended ceiling in the new ACT Law courts building and can be viewed from the street, reception level and mezzanine. The artwork is a reference to the local landscape and an artistic response to the curvaceous wall. The combination of white washed timber and light, as well as the immense scale give the artwork a sense of refinement and gravitas appropriate for its setting. LED lighting strips are used to create a visually dynamic artwork, as bright points of light appear to slowly weave their way through the curvaceous maze of scribbles. The gradual, glowing movement creates a sense of time passing and a feeling of calm, like watching a fire or shadows passing over the landscape. “As an artist I am struck by the use of the Scribbly Gum in civic planting as you enter Canberra. The patterns themselves are beautiful graphics and unmistakably those of the Scribbly Gum, even when appropriated, enlarged and reproduced. Bringing these patterns into the interior of the court creates a sense of place, a link to the local landscape. The Scribbly Gum also lends the artwork a light touch as it reminds us of the wonder of nature, and nature’s ‘sense of humour.’ The whimsical patterns on the scribbly bark bring to mind childhood, and time spent in the bush. It is a reminder of our native land, the place that grounds us and links us together. It is a symbol of the culture and landscape to which we belong.” Jade Oakley. 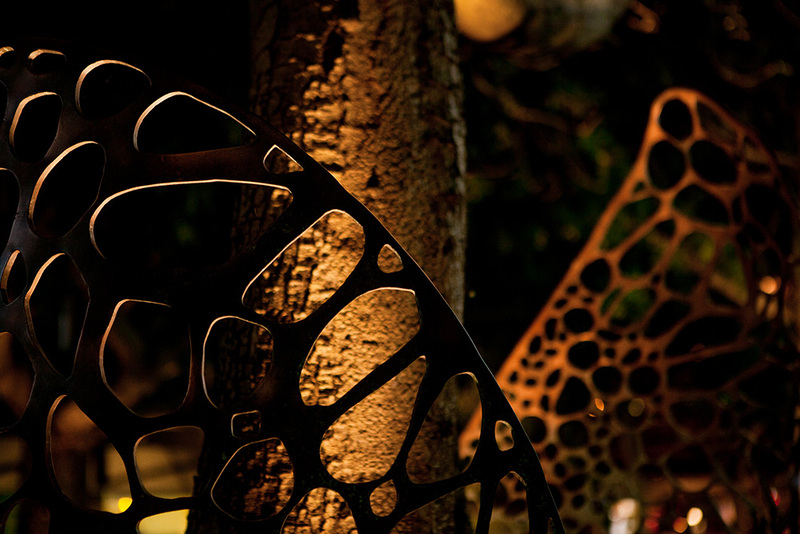 Scribbly Gum was a 14-month process from concept and design development, through to installation. AAP Art projects, the art division of Axolotl, were instrumental in the design process working closely with Jade Oakley to ensure suitability for construction, installation and engineering. The unique artwork canvas with no straight lines provided the first challenge. To overcome this we brought the installation team Stratti Build in to the project early on. The wall was surveyed on site via cherry picker and drawn on CAD. Over twenty templates were then produced from a datum point on the wall to allow for the successful mapping and installation of the artwork. Scribbly Gum is made up of over 100 individual panels up to 3360 x 1560mm in size, and is split over three depths. Each layer has been sanded and treated in the Axolotl factory with Axolotl Timber Wash Interior Roan paint with varying opacities. Images of Scribbly Gum's design development can be found here. Axolotl are once again proud to be Supporting Partner of Sculpture by the Sea, Bondi for 2018. This year we provided material sponsorship and artisan support to a further four artists - Michael Le Grand, Lucy Barker, Jim Flook and Rhiannon West. Each selected based on the quality of their concepts and our capabilities to assist with their diverse aesthetics. It has been an exciting and challenging process supporting each artist to realise their vision, and reinforces our own commitment and passion to support the arts. The 22nd annual exhibition can be enjoyed on the stunning coastal walk between Bondi and Tamarama, until the 4th November. 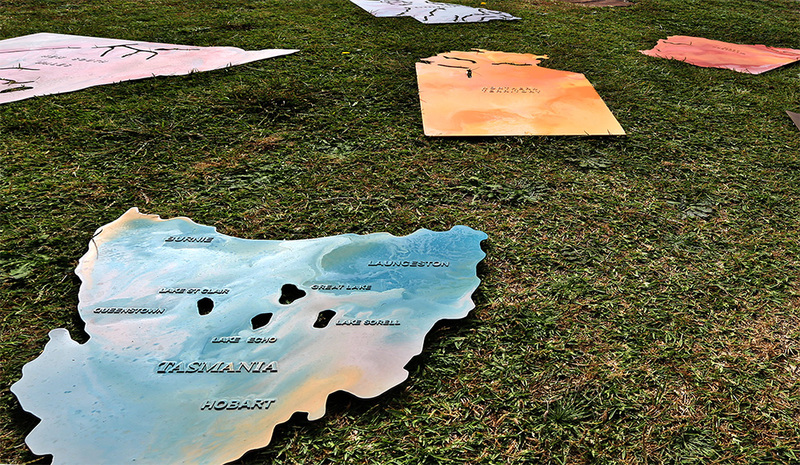 It is the world's largest free public exhibition and transforms the coast into a 2km long outdoor gallery, featuring over 100 sculptures by Australian and international artists. If you are an artist looking for an experienced and passionate partner to facilitate your art projects, Axolotl, through our specialist AAP division can offer a range of services. We have experience designing and fabricating in an extensive range of construction materials as well as offer a range of unique, proprietary surfaces. To get in contact email art@axolotl.com.au or phone 02 9666 1207. Guardian is the balancing act of found and shaped metal objects formed to establish a nominaltotemic orientation. A dense and complex tangle of discarded electrical cables in an intentionally ambiguous form. Outlet is constructed in a lozenge shape that could be a missile, a seed, or perhaps a lump of human detritus rolled by the sea and washed up on the rocks. With connotations of consumption and entrapment, its worm like tangled surface is visually perplexing in its complexity. Contemplation of unfolding and unpredictable swerves of life's complexities. vibrant; dichroic lenses form the “tips” to the wings which reflect and refract the light. 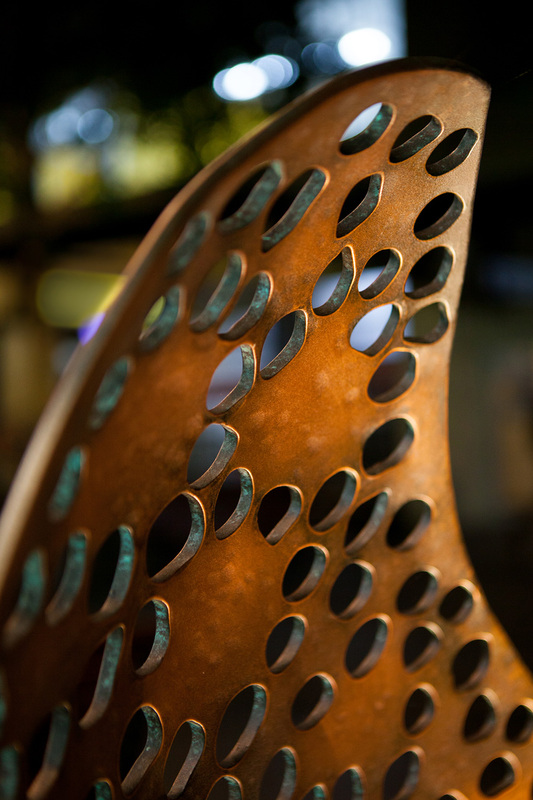 Jade Oakley’s Interplay is a site specific public artwork which was commissioned by Waverley Council after winning the public vote. The artwork aims to protect, celebrate and draw attention to this important natural feature in this busy urban mall. "When I first thought about Waverley Mall as the site for a public artwork I was drawn to the trees. They are the most beautiful element in this place. They provide shade and shelter, beauty and calm. Every branch describes a different curve through the air. Every single leaf of these trees is unique. I wanted to embrace them. ‘Interplay’ expresses a symbiotic dance between art and nature. The sculptural forms are poised mid-waltz with the trees. Each of these screens is unique, inspired by microscopic photographs of plants. They are intended as a reminder of the little marvels that surround us; growth, decay, transformation. AAP worked with Jade Oakley and Creative Road on the design and fabrication of Interplay from concept design through to the polish of the aged Axolotl metal surface treatment. When Westfield commissioned Australian artist Jade Oakley to produce ambient art pieces for their central escalator cladding and a multi storey lift well at Westfield Parramatta she was instantly inspired by the indigenous plants of the area. 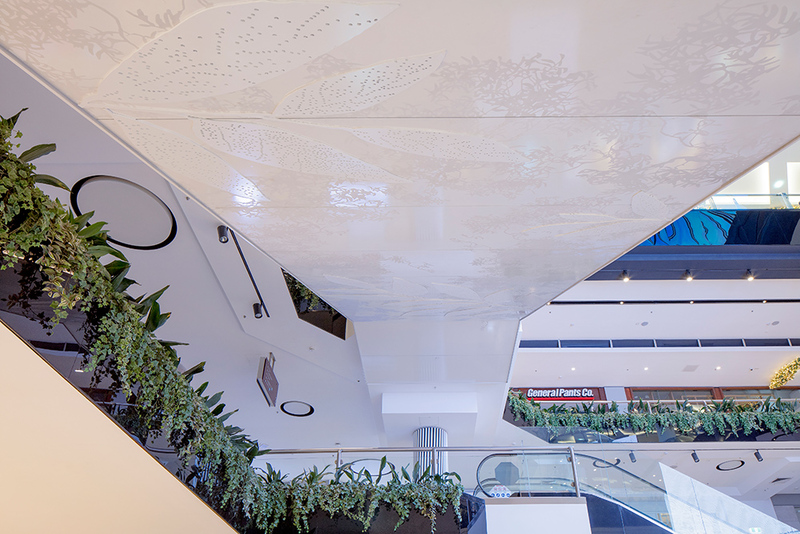 ‘Looking up’ is installed over the body of four escalators located in the centre court of Westfield Parramatta. Created using a white on white palette, this artwork is intricate and elegant all at once. Viewers can study the artwork while walking through the centre court and riding the escalators to the levels above. The cladding is made from Alucobond treated in a custom shimmering white 2pak. 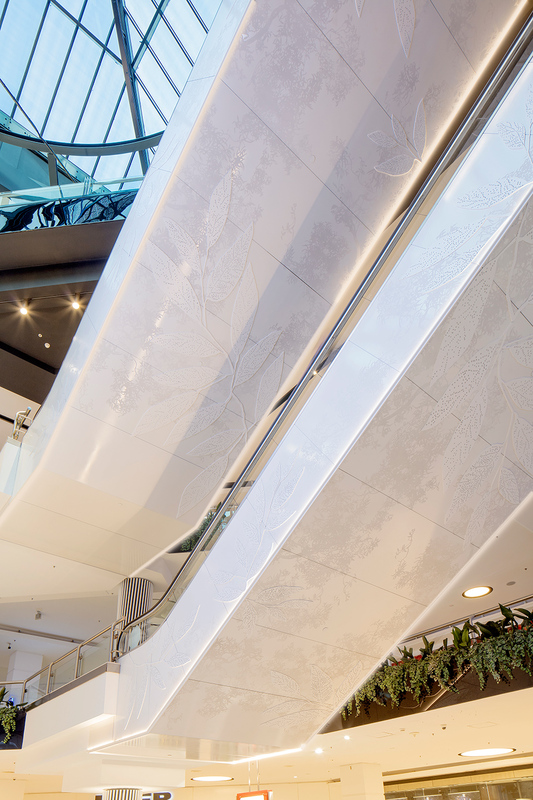 The background features an etched relief of the forest canopy, and the panels are embellished with a second layer of perforated leaf screens that wrap around the sides of the escalators. See more photos of the project, including production and process shots by visiting the project page. Only three days to go until Sculpture by the Sea, Bondi 2017 ends so if you haven’t had a chance, do yourself a favour and get down to Bondi. 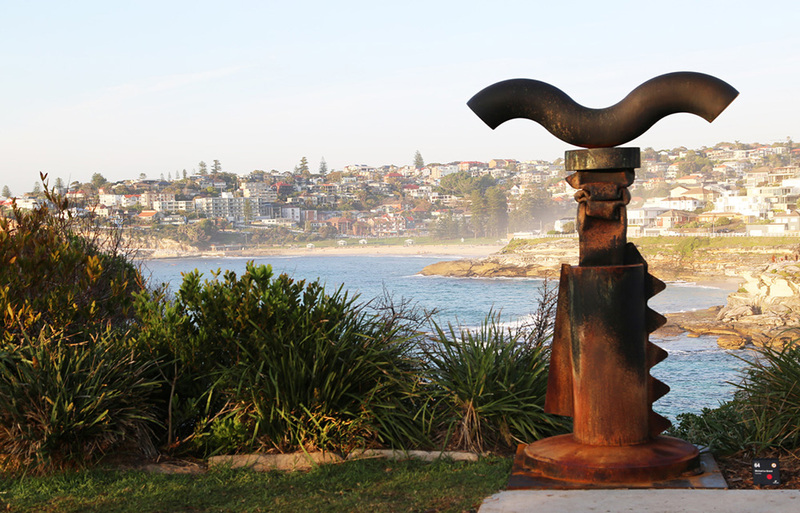 Over 100 sculptures from Australian and international artists line the iconic walkway from Bondi to Bronte. In honour of the exhibition and our role as a Supporting Partner, AAP have put together a small video featuring the amazing work of sponsored artists. Turn your sound up and enjoy. Axolotl is a known innovator in surfaces and world class project management. More recently it has focused on sculpting a reputation within the arts sector as the ideal partner for large art projects. 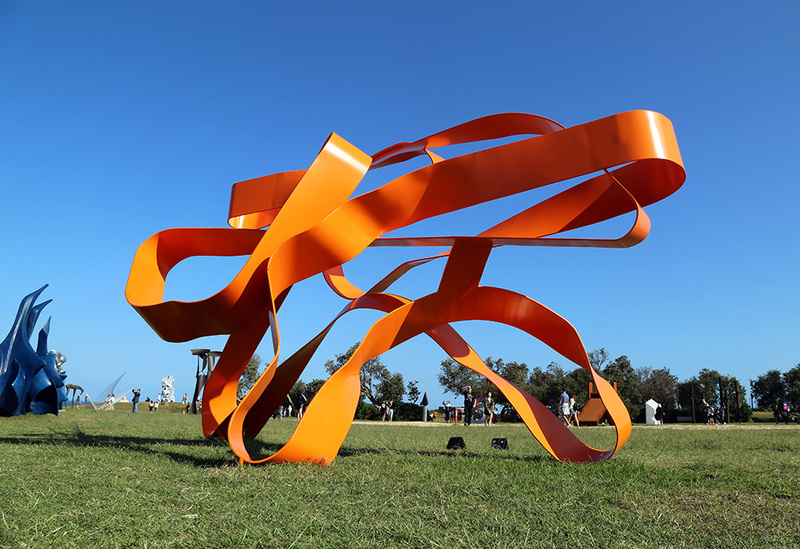 As part of this commitment to the arts, Axolotl Art Projects is excited to announce it's commitment as a Supporting Partner of Australia’s iconic, Sculpture by the Sea. Selected artists will receive a significant contribution in the form of materials and artisan support to help realise their vision. They will be able to choose from the full palette of Axolotl surfaces including metals, stone, terracotta and glass, affording the artist the ability to reinterpret any surface into something completely unique. 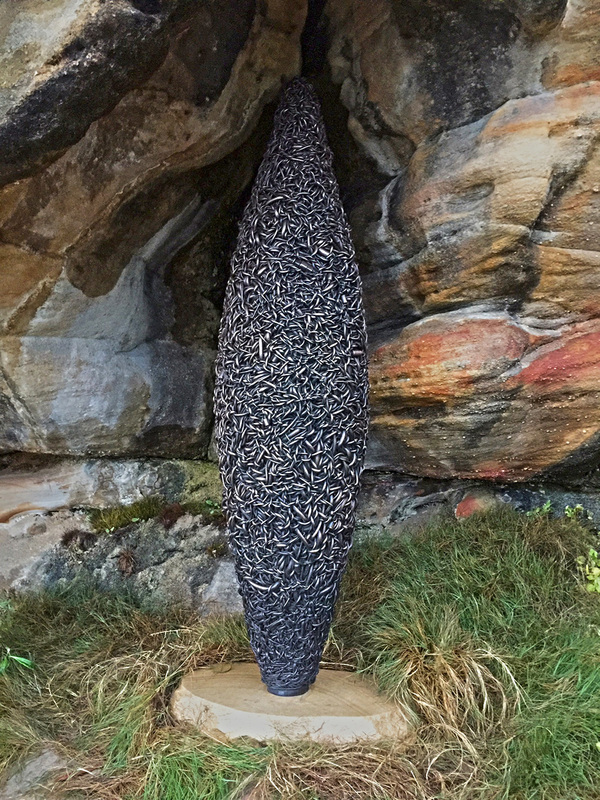 Managing Director, Kris Torma, of AAP says “The creative arts have always been a passion of ours, and we were looking for a way to provide support directly to artists when the opportunity to sponsor Sculpture by the Sea came about. We are incredibly proud of this association and see our relationship growing to be an ongoing, integral part of this amazing and original art show”. Watch this space for updates as we get closer to the launch of the 2017 Sculpture by the Sea, Bondi exhibition. If you would like to bring your own creative vision to life – be it a sculpture, or a living art piece for your home such as a front door or bath - contact our design team today on 02 96661207. Axolotl Art Projects are excited to showcase a selection of the recent public art projects and art collections we have been involved in. Mallee (pictured above), by artist Jade Oakley is the most recently installed public artwork going up in its new home at Bendigo hospital early last month. A set of six kinetic mobiles link between two buildings at the new Bendigo Hospital, injecting the narrow void with an ever-changing canvas for the patients, staff and visitors to enjoy. 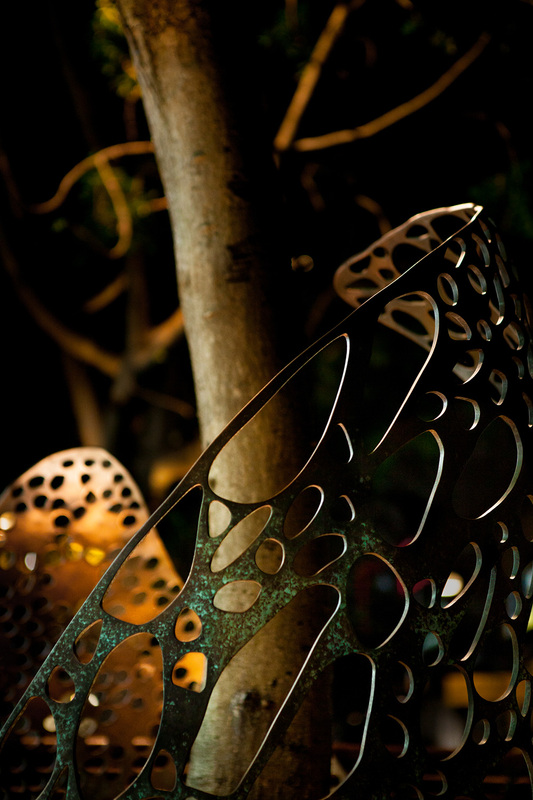 Each mobile is constructed from hand forged stainless steel hoops, a vine of intertwined stainless steel leaves with woven copper centres span the diameter. The mobiles were treated in Axolotl Copper metal and feature dappled green verdigris ageing. Axolotl Art projects were commissioned to produce this intricate glass artwork, drawn by eminent Chinese pop artist Jacky Tsai. The piece is on its way to be installed in the Rouge Lounge on the Genting Dream Luxury cruise liner. 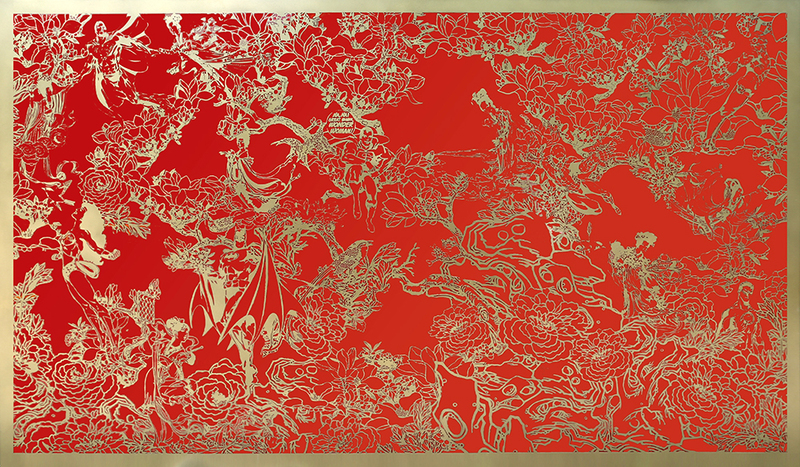 A fusion of pop culture and traditional themes synonymous with Jacky Tsai, the artwork is presented as a glowing red light box reminiscent of Chinese lanterns. 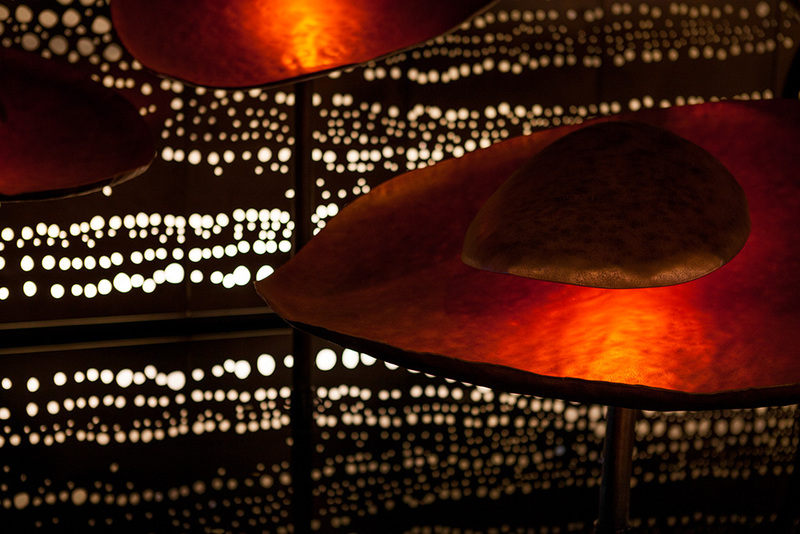 The entry artwork has been created from custom laminated red glass with Axolotl Brass metal LINK on the surface. With intricate details as fine as 1mm wide, it took the Axolotl team over 120 hours just to produce the detail on the artwork. SMC Design Art Consultancy sourced art for the Genting Dream on an international level and worked with renowned artists, as well exciting up-and-coming talent. Our own Emmaline Tuza was also commissioned to create a series of eight custom artworks for the Junket room on the luxury cruise liner. 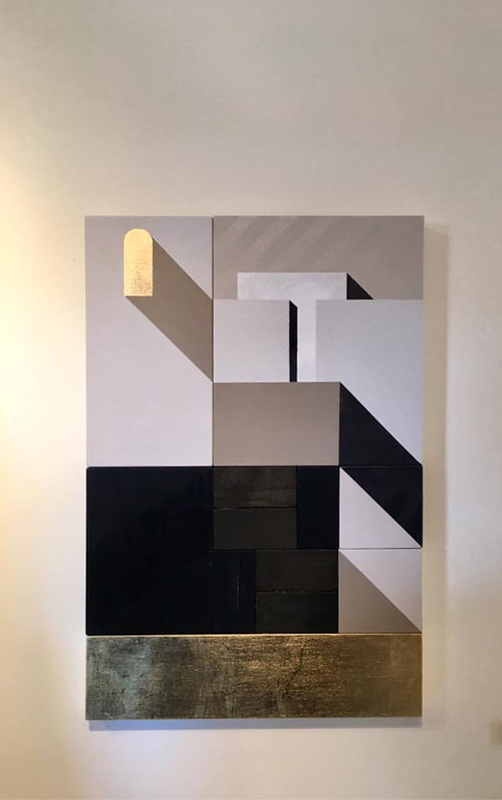 Thee oblique distance set above by artist Lynne Roberts-Goodwin was created for her for closeupatadistance exhibition held in October at Kronenberg Wright Artists Projects in Sydney. The set consists of twenty photo-etched negatives, laser embossed and etched onto 10mm thick aluminium metal. 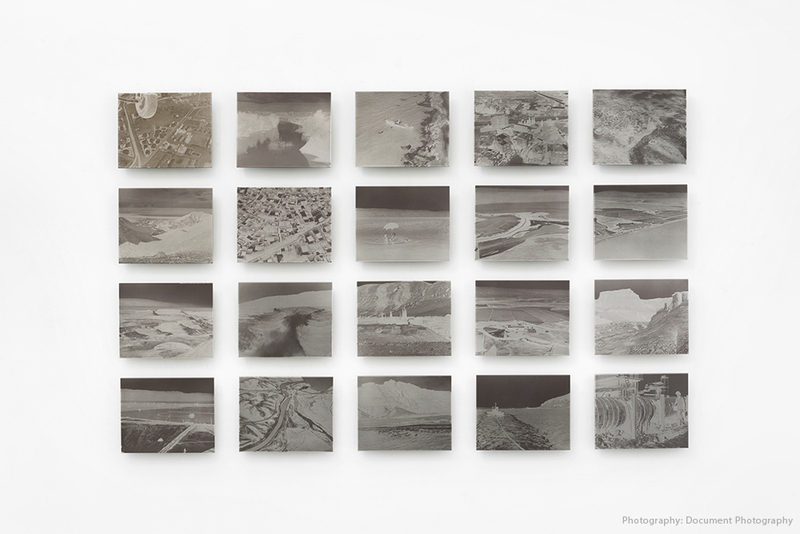 Within this key series the work has engaged with the Dead Sea and surrounding contested sites of environmental and political impact from aerially oblique and ground positions. We also had the pleasure of working with Jade Oakley on her private commission for Otto Ristorante Brisbane. Sketches of intertwined mangroves inspired from Jade’s first site visit were translated into laser cut, hand rolled and welded mangroves in 3mm thick Brass sheet, aged to represent tide and watermarks. The tips of the branches are adorned with kinetic mobiles with leaf elements in brass, stained timber and dyed silk which move gently in the breeze coming in off the river. These projects, along with many of our latest art projects can be seen in more detail on the Axolotl Art Projects website. You also can find more information on showcased artists through their websites below. Axolotl have had the privilege of working closely with Australian artist Jade Oakley on a series of recent art projects. We have received a strong response from our clients, with a number of Jade Oakley maquettes on display in our showroom from current public art ventures. Rain Shadow is Oakley’s latest project, a solo exhibition opening August 23 at the Australian Galleries Sydney. This breathtaking exhibition presents a series of 15 hanging mobiles, 5 ‘Rain Shadow’ lights which combine lighting with copper mobile elements and 4 small free standing mobiles. The body of work is made up of more than 200 individually perforated and aged leaf elements. Each of the copper leaf elements in Rain Shadow have been hand polished and many have been treated with an Axolotl Pearl Patina ageing. The Pearl Patina ageing adds an organic, dappled honey glow to the surface and enhances the delicate styling of the artworks. The metal treatment is also sealed to provide a long-lasting effect that avoids the bright and inconsistent tarnishing raw metals are subject to. We would like to extend the invitation for you celebrate Jade Oakley’s latest project by visiting Rain Shadow – open 7 days, 10am to 6pm, current through to 11 September 2016. Artworks will be available for purchase through Australian Galleries. Submerge into Paddington Reservoir Gardens, where you’ll find TOP5FEET, an immersive aquatic artwork by artist Dale Jones-Evans. You’ll be engulfed by an ethereal pool of water through which a swimmer is completing continuous laps, created by light and sound projections. TOP5FEET is inspired by the reservoir’s original purpose to provide water to parts of Sydney in the late 1880s. The artwork references the reservoir’s original purpose and emphasises its shortcomings. When the reservoir was in operation, the limited elevation meant only the top five feet of water could be used to service dwellings, hence its title. “It’s an unusual public space for Australia, a kind of catacomb of utility – a once water vessel. I thought the site had poetic resonance and delight,” he continues. TOP5FEET has been created in collaboration with Axolotl Art Projects, it is a composition of formed glass, light, sound and animation – filmed at the Andrew (Boy) Charlton pool. Selected by the City of Sydney, it will launch the new year round Art & About festival, where art is brought to the city outside of the traditional springtime festival dates. TEAM Artist: Dale Jones-Evans, Project Management & Manufacture: Axolotl Art Projects, Lighting: Big Screen Projects and 32Hundred Lighting, Audio Production: I-C-S-A, Content: Sugarglider Productions, Model: Cassie Egan, Commissioned: City of Sydney. Over the last year Electrolight have been working closely with Bates Smart Architects on the design for the revitalised Pier One Sydney Harbour, the high-end hotel and conference facility located at Walsh Bay in Sydney. Pier One Sydney Harbour is situated on a former real-life pier originally constructed in 1912. The location affords spectacular views over Sydney Harbour. Electrolight's design for the bar and dining areas features a custom light sculpture inspired by the organic form and movement of the ocean's creatures and the way modern yachts replicate these same movements. 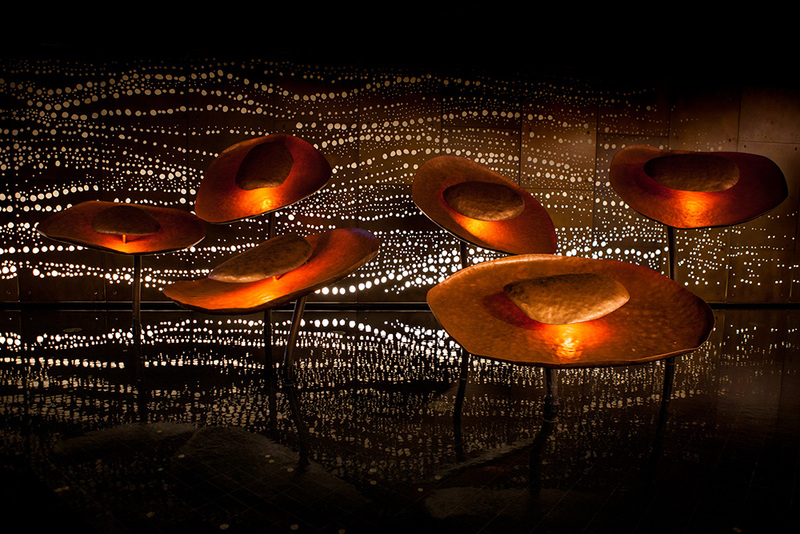 The commissioned work, named 'Squelette', was both conceptualised and detailed by the Electrolight team in Sydney. The detailed design was quite a process, with over 300 parts requiring site assembly, with all parts suspended utilising gravity to hold it's form. Specialist fabricator Axolotl were appointed to manufacture the piece and were instrumental in the realisation of the work, affording Electrolight the opportunity to create the machined organic forms in a lightweight brass aesthetic using Axolotl’s proprietary metal coating techniques. Design Director Donn Salisbury said "It's particularly pleasing to see this project come to fruition. It's not every day you get to work on a project with such a wonderful backdrop as Sydney Harbour. It was the perfect inspiration for our art and provides the ultimate backdrop. Axolotl were key in making this piece true to it's concept, it gave us the ability to materialise our vision." For further information on Axolotl, or to discuss your own unique project requirements please contact Axolotl on 02 9666 1207 or info@axolotl.com.au. Axolotl were delighted to be involved in the creation of this beautiful series of 2 metre tall sculptures by artist Jade Oakley, commissioned by the new Westfield's Miranda Shopping Centre. "My creative process began with a visit to the Royal Botanic Gardens in Sydney. I sat on the ground and made detailed sketches of the pattern of leaf veins" says Oakley who hand illustrated each of the detailed leaf designs in ink. Each drawing was then digitised, scaled and precision laser cut in Mild Steel by Axolotl. The leaves were individually rolled and carefully hand forged to create the rippled surface before being welded to its stem and wrapped around the custom polished concrete base. The sculptures were treated with an Axolotl Bronze Lunar coating, aged with a florentine verdigris patina and hand polished to highlight the bronze and accentuate the forms. "The patina that Axolotl has applied to these sculptures is so beautiful, and just what I had in mind. In places the bronze paint shows through the patina, creating a deep lustre, and in other areas the organic patina glows green against the metal." Jade Oakley. Jade is truly a pleasure to collaborate with, her engagement throughout the entire creation of her artwork from inception through to manufacture is testament to the highly crafted works she creates. Axolotl was recently requested by Distinctive Living Design to help create a thought provoking and meaningful tribute to the ANZAC's, which was launched as part of the ANZAC day commemorations this year. The poppies were made from hand beaten steel and Axolotl accentuated this feature by applying custom finish to the petals and a textural concrete to the stems. 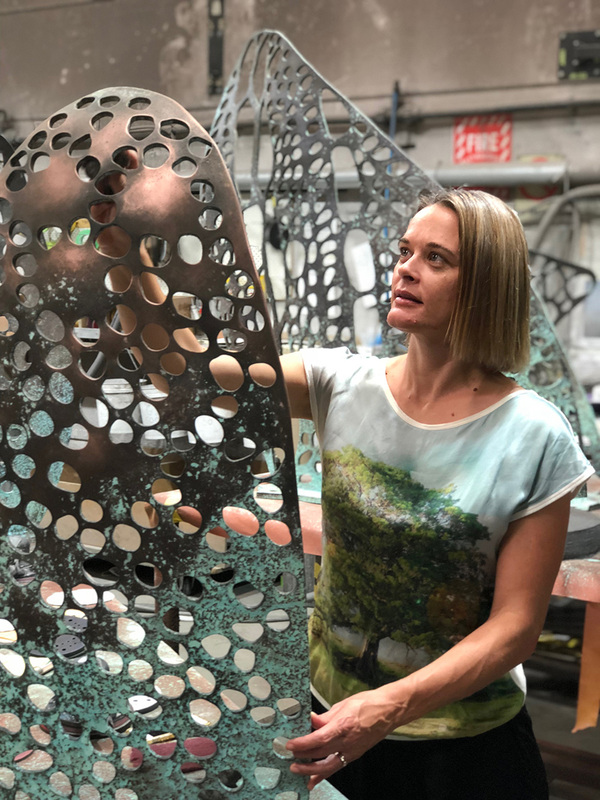 AAP are currently working on completing these large Poppy sculptures with the team from Distinctive Living Design, shown below being galvanised. They will have a bright red finish applied to the petals that allows the hand beaten texture in the petals to read through. A custom pigmented concrete finish will also be applied to the stem. To be installed in Carrington for this years Anzac day commemoration. 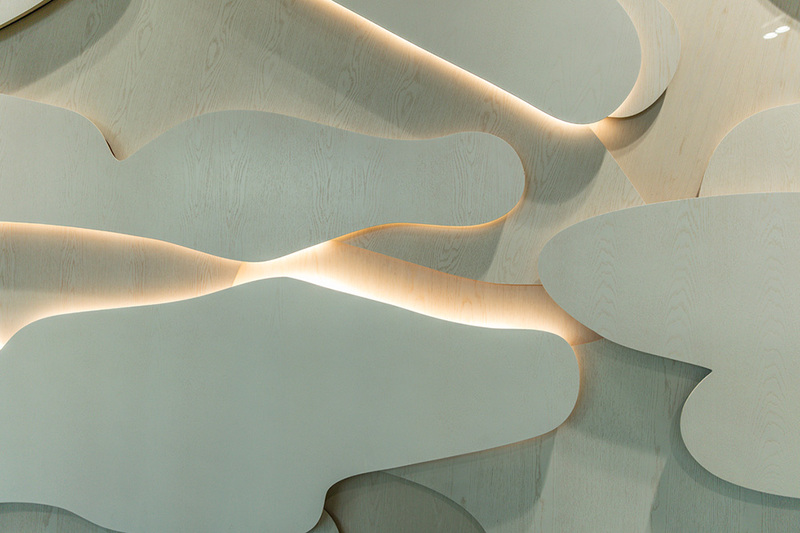 Axolotl Art Projects were shortlisted as one of three contenders from an international line-up to create two feature walls for Hong Kong airport. At this point in time, everything is crossed for success which will be an accolade not just for Axolotl and the many partner companies who have become part of this project, but also for Australian design and manufacturing. Whilst we are unable to disclose our design for the Hong Kong airport due to confidentiality agreements, we can let you know that our new Specular glass is an exciting cutting edge technology, made specifically for this project. A teaser and close up of Specular Glass is shown on the video below which demonstrates the infinite depth achieved using this process. Nestled under No1 Pacific Place, Chatswood is a thoroughfare that is above the ordinary. Axolotl was commissioned by Mirvac Special Projects, to create a back-lit glass feature wall to run the length of the walkway. Artist Pamela See was called on to create the stunning artwork that adorns the glass who then implemented our unique palette of processes to execute the artwork to full effect. The Axolotl 'LINK' glass features an Axolotl Copper coating bonded to frosted laminated glass and then aged with a Verdigris patina. Pamela's artwork was then carved through the metal to allow subtle blades of light to penetrate the surface. The artwork continues through to custom designed, laser cut steel gates at both ends. This walkway is in an area that could have easily been overlooked but is now thought of as the crown jewel of the development. It’s a testimony to how thoughtful art can define an area with a distinctive character and support a positive ecology in the life that works and lives within it. This is the second successfully completed collaboration with Pamela See and Axolotl. The other being the widely acclaimed and award winning Chinatown Kiosk, we featured last year.